An important introduction to the use of the centrifuge in the biology laboratory, Biological Centrifugation is also useful for more experienced workers. 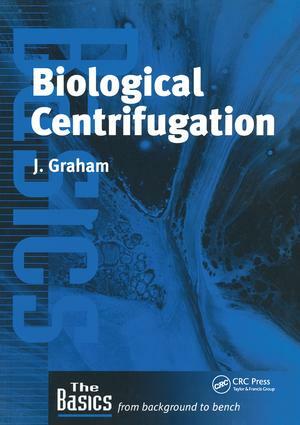 The book describes the background and the principles behind centrifugation, including sedimentation theory. The book also considers the different types of centrifuge and other centrifuge hardware available, density gradient media and gradient technology. Although aimed primarily at the novice, this title also provides information to allow more experienced workers to modify and update existing techniques. Ch 1. PRINCIPLES AND STRATEGIES OF CENTRIFUGATION. Sedimentation of particles under the influence of gravity. Rate of sedimentation. Increasing the magnitude of the gravitational field. Differential centrifugation. Centrifugation in density gradients. Sedimentation coefficients and the svedberg equation. Ch 2. CENTRIFUGATION HARDWARE. Centrifuges - an overview. Basic rotor design. Rotor capacity and performance. Uses of centrifuges and rotors. Centrifuge rotor parameters. Centrifuge tubes. Good tube and rotor practice. Sedimentation of particles in rotors. Rotors for preformed density gradients. Zonal rotors. The analytical ultracentrifuge. Ch 3. GRADIENT MEDIA. Choosing a suitable density-gradient medium. Physicochemical characteristics of gradient media. Preparing solutions of gradient media. Analysis of fractions. Ch 4. GRADIENTS TECHNIQUES. Types of gradients and their uses. Pre-formed discontinuous gradients. Pre-formed continuous gradients. Nonlinear gradients. Self-generating gradients. Harvesting gradients. Ch 5. PURIFICATION OF MAMMALIAN CELLS. Introduction. Selection of medium. Handling of gradient media. Centrifugation strategy. Peripheral blood mononuclear cells. Human monocytes. Dendritic cells. Isolation of islets of langerhans from porcine pancreas. Stellate cells from mammalian liver. Other low-density cells. Ch 6. FRACTIONATION OF SUBCELLULAR ORGANELLES. Introduction. Homogenization of tissue or cells. Physical characteristics of subcellular particles. Differential centrifugation of a rat liver homogenate. Purification of organelles in gradients. Ch 7. FRACTIONATION OF MEMBRANE VESICLES. The membrane compartments. Density and size of membrane vesicles. Separation strategies. Endoplasmic reticulum. Golgi membranes. Plasma membrane and membrane domains. Isolation of vesicular membranes by density perturbation. Analytical gradients (secretion). Analytical gradients (endocytosis). Ch 8. FRACTIONATION OF MACROMOLECULES AND MACROMOLECULAR COMPLEXES. Buoyant density banding of nucleic acids and proteins. Rate-zonal (sedimentation-velocity) banding of proteins and ribonucleoproteins. Viruses. Plasma lipoproteins.